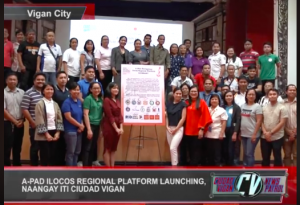 On February 25, the sixth regional platform A-PAD Ilocos was launched by Asia Pacific Alliance for Disaster Management (A-PAD) Philippines at the Vigan Culture ad Trade Center in Vigan City. Through cooperation and coordination among government, the private sector, and non-governmental organizations, the regional platforms aim to deliver a more effective disaster preparedness, prevention and mitigation, emergency response, relief services to the community. The five other regional platforms are: A-PAD Davao, Bicol, Central Visayas, Eastern Visayas and SOCCSKSRGEN. The launching ceremony was attended by A-PAD Field Coordinator, Ms. Athea M. Penaloza, and A-PAD Philippines partner organizations such as local government officer, chamber of commerce, disaster relief NGOs in the region. The ceremony was broadcast on local television network Ciudad Vigan News Patrol.